Home » Main Featured, Resources » How Much Do Solar Panels Cost to Install in 2019? After tax credits and rebates, the cost to install solar panels on an average-size U.S. home in 2019 is $11,200 to $14,400. Keep reading to learn the factors that decide your costs. Installing solar panels is more than a 20-year investment in your home and green energy. To budget correctly, it’s important to know how much it costs to install enough photovoltaic (PV) solar panels to power your home or business. 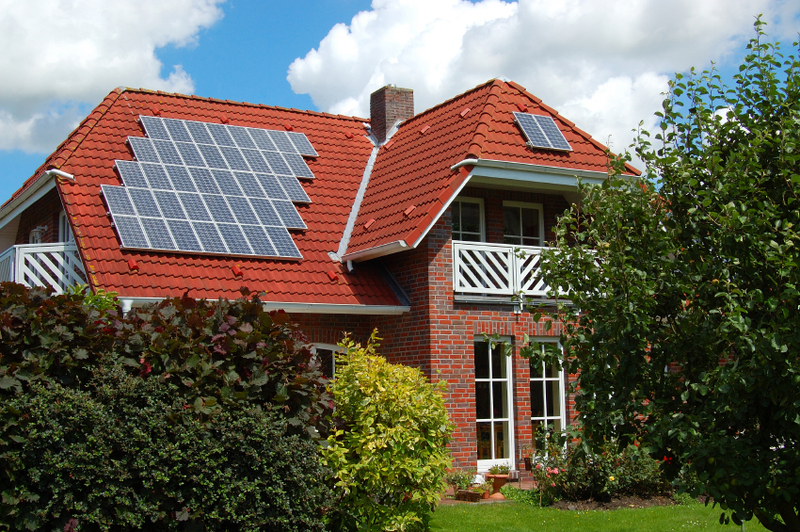 Determining costs and the ideal solar system setup can be confusing. To help, we’ve included guidelines that put costs in perspective. The standard way to evaluate solar panel system cost is cost-per-watt, or dollars-per-watt. It’s calculated by taking the total cost to install the system (parts and labor) and dividing by how much power it produces (electrical output). The price of solar power will vary based on other factors including the state you live in, the installation company, and any rebates and incentives collected. In 2019 someone in California can expect their cost-per-watt to range from $4.39 for a small system, down to $3.56 for a vast system. Based on research from SolarReviews, the installed cost of solar panels was between $3-$4 per watt: A 5 kW system would cost around $14,000 to $21,000. Many utility companies offer incentives, and some subsidize as much as 50 percent of system costs. Even at half the cost, a system that generates an average of $75 of electricity per month could take a long time to pay for itself. Here’s an example. A system that costs $18,000 has a payback period of about 20 years. The cost of a solar panel today is around $3.93 per watt, and the extra cost of installation brings expenses up to $5- $6 per watt. Installation costs for PV systems include both labor and the electronics needed to tie the solar array into your existing electrical system. The rule of thumb is that the average U.S. household consumes electricity at the rate of one kilowatt per hour (kWh). There are about 730 hours in each month, and the national average price of a kWh of electricity is $0.10. So an average monthly bill would be around $73 for 730 kWh of electricity. The average electricity bill can vary considerably if you have non-standard items, such as a hot tub, or some electrical appliances running continuously. Extended computer use, plasma screen TVs and video games consoles can also make an impact. Your usage will also increase significantly in months when you run an air conditioning unit or heater. Finally, the cost of electricity varies widely across the USA, from as low as $0.07/kWh in West Virginia to as much as $0.24/kWh in Hawaii. To get a precise estimate, you’ll want to adjust our calculations to fit your electricity usage patterns. A conservative value to use as a solar panel’s generating capacity is 10 watts/sq. ft. This value represents a panel conversion efficiency of about 12 percent, which is typical. This means that for every kW you generate, you need about 100 sq. ft. of solar panels. If the sun shone 24 hours a day, you could put up 100 sq. ft. of panels and have enough energy to power the average home. The average sunshine across the country varies. In Seattle, Chicago, and Pittsburgh you’ll likely get up to three hours of direct sunlight. In states like Colorado and California, you’ll probably absorb five or six hours of sunlight. Homes in sunny Arizona can get nearly 7 hours of sunlight per day. The amount of average sunshine means that the size of the panel array required can vary, anywhere from 400 sq. ft. to 800 sq. ft. (i.e., 4 kW to 8 kW), depending on where you live. You’ll need more panels if you live in a location that gets less sunshine per day, and fewer panels if you live in a location that gets more sunshine. If your utility company allows you to have net metering — that is, they supply you with a special meter that will spin backward when you generate more electricity than you use — your annual bill can average out at zero. Because of shorter days in the winter, you’ll likely be a net purchaser of electricity in that season and a net producer in the summer months. 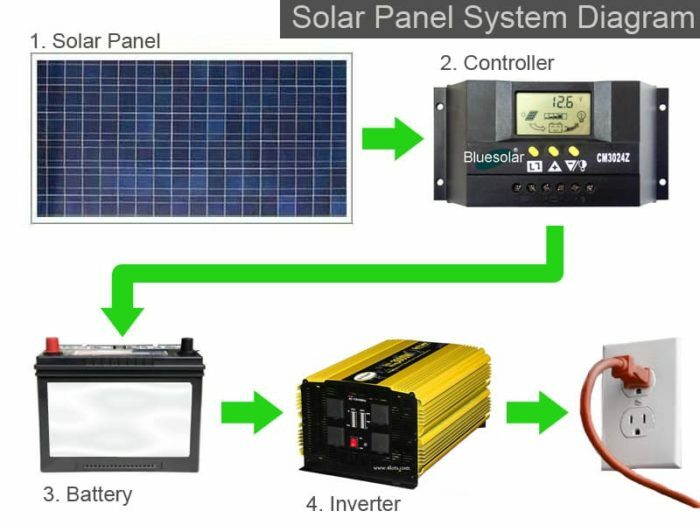 A grid-tied system like this is different than off-grid systems used in remote locations with no electrical service; those require batteries, which can significantly increase overall system costs. The entire system is what drives the cost of solar up and equipment like batteries need to be replaced over time. The good news is that the costs for solar panels are expected to continue to drop, as thin film panels from companies like First Solar, Nanosolar, and AVA Solar become available to the residential market. Right now, though, First Solar is only selling to commercial customers. Nanosolar and AVA Solar have yet to ramp up their production facilities. It will be interesting to see where this all goes in the next year or two, since these companies are talking about very aggressive price targets — in the order of $1-2 per watt — and volumes that are several times today’s total output. Assuming that installation and auxiliary equipment costs can be reduced to around $1 per watt, then a 5 kW system may cost as little as $10,000, and the payback period would be 10 years, even without subsidies. This makes PV solar installations much more attractive. Of course, all this assumes that electric rates stay constant. However, they are likely to rise as fuel and other infrastructure costs increase, so payback periods may be even shorter in the future. In the meantime, expect to see more PV solar panels installed on roofs, especially in areas with favorable solar conditions or with higher-than-average electricity rates. Want to get an idea for how much you can save? Here’s a calculator you can use to find out! This is the best information I got about solar power. We purchased a home and moved in last month. I want to install a Solar PV system. We use about 1,000 KWH per month. We will get about 5 hours of usable sunlight because we will in Saratoga, Northern California. To generate 40 KWH needed per day I need to install a 8 KW system. When the cost comes to about $15,000 then I will go ahead and install it. I even studied making my own solar panels. Your article is the best I have read so far. So it looks like they are in the banking or subscription business and want people to take out a loan for 30 years that each year could go up by up to 2.9% add on interest on top of what you first sign the contract at. Can you imagine? In spite of the claim of lowering your electric bill it’s a suckers game to trap you into a long term loan that overall is likely to be a lot more expensive than your monthly electric bill. With significantly lower rates from electric utilities, my bill shrunk from ~ 200/month to around $ 80.00/month. Buyer beware! You will get about 2x hours in summer compared to winter. I am over the hill in Santa Cruz and have had Solar PV fo 9 years now, I read the meter each morning, so I have a lot of data. But the length of the day in summer is much more than in winter, as you know. I am thinking that if the payback period is 18 or 20 years then the costs of systems in general might be inflated? What I mean is this, by analogy, if it costs 650,000 for a one bedroom apartment which would rent for $3,000 per month, but someone is willing to offer smaller prefabricated modular housing which costs $65,000 to construct, yet they ask $1,000 per month… What I am getting at is that I get the feeling that maybe the manufacturer extrapolates the price as a function of the costs that someone would otherwise be paying per month x 18 years, or 20 years? Another way to express my skepticism, let’s say a carpenter can add a room to your home and that room represents $50,000 in additional value. The carpenter working by the hour at a reasonable pay rate could leave the homeowner with a $30,000 net gain. But, then why would the carpenter want to provide all that free value? So, he charges up to $50,000 to add that room; but then, in calculating the rising rate of home prices the carpenter decides that maybe he should gain a bit of future value, so he charges $60,000, knowing that the property owner will eventually over time be able to recoup the costs on selling the home but for the time being it is simply a matter of how badly they want to add the room onto their home…? I installed a 7280 (56 Kyocera 130GT panels) watt array 2.5 years ago on Long Island. The system is ground mounted, a couple of degrees off true south with a 35 degree tilt. I used 35 degrees because most online solar calculators (NREL and Kyocera) showed that angle to give the highest annual output. We net meter. December output is a little lower with latitude tilt, 42 degrees, but higher on summer afternoons when the grid needs it. So far for 2.5 years we’ve had about 25,000 kwh of output. We installed the system ourselves and the cost was about $47,000. It’s 560 sq. ft. I think it was the best investment I ever made. Notice how the pay back periods seem to surprisingly coincide with a timing cycle similar to that of a MORTGAGE? If solar panels had a payback period of say 7 years then I think they would be more reasonably priced and a lot more popular with consumers! It doesn’t scale Larry. You still need generators because the sun does not shine 24/7. The problem with solar has never been the cost of generation but the cost of storage. Right now for the individual consumer the power grid can be used as a battery but if everyone tries to do all at once the battery breaks. You need to add in the cost of maintaining that battery which means the cost of generation stations used when the sun don’t shine and the wind doesn’t blow and Hoover damn doesn’t hold any more water. I THINK THE SUN HAS GOTTEN TO YER’ HEAD, LARRY! It is still too expensive. No one breaks even if they account for the Cost of Capital (say, 6%). All breakeven analyses of 18 years or so are done without accounting for the time value of money. Doesn’t apply. You’re assuming one use that same capital to pay their electrical bill. GK – Thank you! While I am all for alternative energy, a standard for the industry seems to be payback period. Somewhat useful, but not like a present value analysis. Great article, would love to see an updated article that includes more recent prices. Even though powering my home sounds great, I was thinking more about the investment side. Lets say I only need 1500 KWH / month. If I produced 3000 KWH / month, would my utility pay me for my additional power? Great article, I have a quote for a 200kw system at about $855,000 for all the parts including about 800 panels. What would be a reasonable cost to put all the parts together prior to hook up to sell to the grid? the system will be roof mounted at 30 degrees. I have been quoted $600,000 for installation but that just does not seem right at all. Hey Dave, yeah, that’s a lot of money but it sounds like you’re wanting to install a huge solar array. 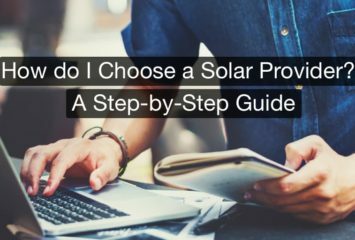 I’ve got a solar panel installation cost calculator you can try at https://www.solarpowerauthority.com/calculator/ that provides quotes for both residential and commercial installations. Hopefully this tool will help you find some better rates or at least confirm the one you got. $600K is a lot of money but it’s money well spent as far as I’m concerned. Also, WhiteSites, the calculator should help you find some more recent solar cost estimates and apply your location and energy provider to the mix. My company has been in solar for 20 years and I have been it almost twice that long. When I started selling solar panels they were $7.00/watt, from the factory I worked for. Today my company sells them for as low as $1/watt. We sell the rest of the equipment (inverters, disconnects, cable etc.) for an average of a $1/watt. According to David Katz of AEE Solar, a pioneer in the PV business for 40 years, the average PV installation be between $1.00 and $1.50/watt. The difference of $3.50/watt installed compared to your estimate of $7 to $9/watt in Jan. of 2008. One of the problems that is keeping PV from becoming cost effective is the charges that installers are charging customers. In many cases we have seen the cost is often more than the system. In one case it was if the installers on the roof would have been making the equivalent of $300 to $600 per hour. Of course the contractor’s company is making that. Why don’t you look into the inflated costs contractors are injecting into a single system quote. It’s important that people get a seperate quote for their system and their installation. In an average house would it be wise to use solar and wind energy. There is a lot to consider and it’s hard to pin down an “average house”. What are your views on the future price of energy? Does your city/state have a power purchase agreement? Will you be using the electricity to power an EV or plugin in the future? In my opinion solar is the easiest to do when compared with large scale wind but you could also consider small wind turbines. In that case you need to determine if there is wind where you live (this has nothing to do with the average US house, it’s about your location). Wind is cheaper but very inconsistent in some places. In my view, if you are excited about renewable energy and can afford to have some systems put in place then do your homework on state incentives and consider installing it yourself or get a quote from a local installer. We have a free solar quote system on this site at https://www.solarpowerauthority.com/calculator/ share what you come up with and decide on doing. Note that there are several “state guides” under Rebate Programs listed on the left menu. What state do you live in? This is all a tap dance and a bit like the emperor’s clothes. If you use the above mentioned calculator, you will be hounded by every company installing solar in your area. I spoke to Tesla. They figured out my roof size vis a vis my house square footage and I gave them my average elec bill of $700 (Yes, I live in the NY area) and came back instantly with a price for solar tiles of $138k which would pay back in approx 14 years. I think I am going to settle for a solar pool heater only. Who knows if I’ll be around in 14 years. And yes, at 5% (if you access your home equity line) with simple interest, It will cost you $7,000 per year just for interest. Since your electricity is costing you $8400 per year, will the Solar electricity cover the cost? If so, can you assume a savings of $1400? And who knows where home equity interest rates will be? Nevertheless, at the end of 14 years, theoretically, you will have a paid up system saving you $1400 per year and still owe the installation cost to the bank since you paid interest only on the loan. OR you can bite the bullet, be your own bank, and pay yourself back at the rate of $7000 per year. If the solar covers your actual electricity cost, you also put $1400 (the difference between the interest you are paying yourself for covering the installation and the cost of your electricity without solar) in your pocket. At the end of 14 years, you will be saving $8400 per year on electricity assuming no increases. If you don’t live that long, the new owners will be pocketing the savings. Will that increase the selling price by $138k? : That’s what you have to ask yourself! I’m guessing since my house is heated with gas solar power wouldn’t help at all, since that is my highest utility bill??? Hey Judith, I wouldn’t say that solar won’t help you “at all” because most people still use a fair amount of electricity even if their house is heated by gas. Things like TV, lights, computers, laundry, dish washer all use electricity. I have also seen very affordable portable electric heaters that could help to heat individual rooms at night depending on how your house is laid out. You could definitely mitigate your natural gas usage each month with a bit of planning. Solar is expensive but if you can offset the way you use natural gas it might be worth it. Only 20 Years ago, solar energy cost 7 times as much. Advanced technologies have contributed to the enormous decrease in price, but it is mainly due to the increase in manufacturing volumes, as more and more people realise the benefits of solar energy. They did the math wrong. The pay off would be much sooner. If you take into account that you would be saving that $73/ month, you could reinvest it into paying off the cost of the solar panels, which would in turn reduce your interest rate and the overall time it takes. So instead of just keeping the money, you use it to pay off the loan to buy the equipment. SO.. this is where it gets interesting. If instead for the next couple years you take that $150 a month and use it to pay off the loan for the panels at let’s go crazy and say a 6% APR, it would only take you 7 years and 2 months to pay it off. (you can use an excel spreadsheet and get the same answer) Once that time is up, then you are just making a profit off of the electricity you are using. The fact that you don’t pay anything in and of itself is a gain. Just because you don’t get a literal “paycheck” doesn’t mean that you aren’t saving money in the long run. I would much rather not pay for my electricity for the rest of my life then not take advantage of it because i want to see the actual profitability. Also, the example you used would pay for itself in the same allotted amount of time. For any amount of electricity you use /month, it should pay itself off in about the same amount of time. So, instead of that 20 years, it is less than half that time. If you are looking for an actual paycheck, then you could always buy more panels than necessary. Which i would recommend. Sorry for the rant, I just thought that it should be addressed. Katie, your units are way off. You don’t use 1154 watts/month, you use 1154 kWh/month. That’s 1,154,000 watt/hours per month. The system is $9/watt. Let’s say you want a 1000 watt system and you have, on average, 5 hours of usable sunlight per day. That system will cost $9000 given the prices above and will produce 5 kWh per day, or $0.65 of electricity per day, or ~$20 in electricity per month. At 6% interest, it will cost you $45/month in interest. That is, the 1000 watt system would not even pay for half of the interest on the system at 6% annual interest alone and would never pay it off. Now, let’s say the cost was a lot cheaper. Say with modern prices of $3.50/watt installed and at a 3% interest rate from magic loan, that puts you at 230 payments, or a payoff time of around 19 years. At 0% interest, say you pay for it out of pocket, then you can pay it off as quickly as 15 years, but then you lose the fact that you had $9000 to invest or gain interest with way back when, so you’re still way behind. The time value of money doesn’t necessarily apply here. Your electricity expenses are more of a sunk cost. The money you would be spending on your electricity would not earn you any interest to begin with. Plus, even if you were not to get a loan, if you consider the fact that most venues that you can invest your money in tend to have an interest rate of near and around 1%, you would not be making very much money off of it sitting in a bank. In fact, after, if you consider my other post, 7 years, you would be making more money than you would be if you had in fact invested else where. $18,000 would make you $15 a month in a bank at 1% (simple interest, of course this would go up a couple cents every month, but it would not exceed at most $17/ month depending on the compounding within 7 years) you would be making $260 a month based on a $18,000 investment. That’s about 17%. 17 times more money sounds like a heck of a good deal to me. Plus the fact that you are helping out the environment and all that fun stuff. None of these things matter however, if you’re not receiving conversions. Cost is not the only consideration. In today’s toxic political environment and power grid weaknesses one can’t predict what will happen in the near future. Grids can be hacked and damages to it could take weeks or months to repair. Plus,more and more people are buying plug in electric cars which use lots of power that will tax the grid to the point of brownouts. Most of us can’t live without electricity because we’ve been so accustomed to it being available every time you throw a switch. Great article with lots of facts. It’s helped me understand the cost for my house. Payback time is an interesting issue, including future price of electricity as well as the independence offered. – This article goes through the basics of designing a properly-sized solar power system, including calculating your inputs, loads and battery bank size. Great article; I am considering moving to Hawaii and currently the power rates are at 35 cents per KW! In texas where i currently reside and use renewable sourced power its 11 cents. Thus I can see investing in solar/wind not only for cost savings but, primarily for the environment. I have researched a bit on the various types of systems and would be interested to see if anyone has heard about the Solar flower: solarflower.com It seems it can produce 4kw/hr and it is portable and low cost of installation plus it looks really cool. I have seen this type of system used commercially in Germany for years only the array was industrial and very expensive but, definitely cool! Thanks again for all the helpful info and when my move goes through, one way or another I will be installing wind/solar array. Solar Panels sound like a great investment HOWEVER, my advice to all of you is to be extra cautious with these solar companies. It seems that NOBODY is making them accountable for their wrong actions. Do your research before agreeing to anything. It has been a nightmare for me dealing with Pure Solar located in Corona California. If Solar is such a good deal and cost saving over x-number of years, then why does the Federal Government not mandate that every Federal Building in the US, and those overseas, install Solar Panels. And one more question…When Solar batteries wear out and need replacing, where does the dead, discarded Solar Batteries end up….the local dump/landfill? One of the most obvious reasons to invest in solar power is because it’s a renewable energy source. This means that we’re able to continually harvest the energy from the sun. Forever. Great post and thanks for sharing! Solar is the future! The price does vary and of course, it depends on many factors like system chosen, panels and batteries chosen, and also the square footage of the home/business and so on. I live in the San Francisco Bay area (CA) and had a 3.5 KW (12 panel) system installed several years ago. My total cost divided by the total contracted output over 20 yrs gives a rate of $0.12 /KWh. My electric utility rate plan is a net metering solar and EV (electric vehicle) time of use plan. I charge my car at night, off-peak, for about $0.10/KWh. The off peak rate is about $0.20 and the peak is at about $0.35 / KWh. (Weighted average summer and winter rates). So that means about 60% of my energy production is at part peak rate and 40% at peak which gives weighted average of about $0.26/KWh. (More detailed weighting of summer/winter and weekday/weekend gives 0.2589). My contracted energy is 4650 KWh/yr. So at $0.26/KWh, I am producing about $1,200 of saved electricity per year. Payback would be $11,856 / $1200/yr => ~ 10 yr. If electric rates go up (they haven’t gone down yet…), payback time will be shorter. It’s good to learn about the price of solar panels. I like the fact that the panel area varies from place to place, and that I live in a place with probably around 6 hours a day. That shouldn’t be too big of a panel area, right? A very well-developed post on cost to install solar. This is awesome, i really wish we could have tutorials like this where the government in my country could get ideas and act accordingly, it would have been a very nice thing. We hardly even have enough energy to iron, play games and other things.